Do you take better care of your car than you do yourself? If that is you then it’s time to change, and there’s now help on offer with the new book “The Better Man Project”, with 2,476 techniques and tips that are designed to flatten your body and sharpen your mind and with 35 DIY plans for men to make them healthier and happier. Bill Phillips, editor in chief at Men’s Health magazine first puts you to work with a few fitness tests that will assess your overall level of fitness starting with the plank position. Get on the floor with elbows under your shoulders and ankles together – imagine you’re squeezing a walnut between your feet – and hold the position for 2 minutes. What you’re measuring here is your core strength, which contrary to popular belief isn’t just your abs but all your muscles between your shoulders and your waist, its the foundation of all fitness. If you can’t hold it together for 2 minutes your core strength isn’t strong enough but there are plenty of exercises in the book to fix your core. Next up is the sit and get up exercise that requires you to simply sit crossed legged and get up without using your knees or arms. The correlation between fitness and health is quite interesting: if you can do the sit and rise, you are 6 times less likely to die prematurely. There’s also the height to waist ratio, so say for example you are 5ft 6inches your ideal waist measurement should be around the 32 inch mark. Take a blank piece of A4 paper and with a marker print your name on the paper with your eyes closed. Now with your left hand or the hand you don’t usually write with again print your name with your eyes shut. This way you’re asking the brain execute instructions it’s never received before helping it to bring sharpness and clarity to a part of the brain that has before remained unstimulated. 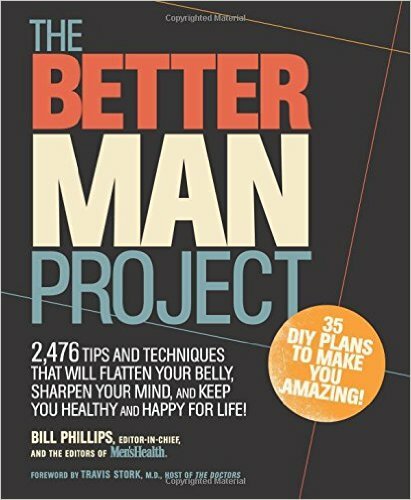 Be a Better Man by Bill Phillips, is available on Amazon.